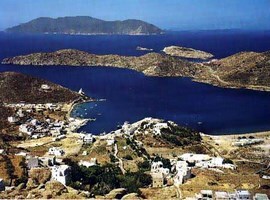 Ios is a beautiful small island in the Aegean Sea and belongs to the Cyclades Islands complex. The island is famous for its intense nightlife and it’s a loved destination especially for the young people. Ios has the typical form of a Cycladic island as it has golden sandy beaches, crystal blue waters, the traditional ‘’Chora’’ where you can see the white houses with the blue windows and a rocky ground. In such a small island there is a total of 365 churches, one for every single day of the year. Ios is the island which according to Herodotus the epic writer Homer died . The island of Ios is near to Santorini and Amorgos, it has length 17km, width 7.5km and its highest point has an altitude of 713 metres. Ios is also famous as the youth island or the party island. It’s already mentioned that it has an intense nightlife. The music, the dance and the parties can last for all day long and that’s the reason many young people from every point of the planet, visit Greece and this happy island to spend their holidays, have fun and meet other people. Ios has some of the most beautiful sandy beaches of the Cyclades Islands. The visitor can approach them by land or on a boat if it’s difficult with another way. Mylopotas: This beach has a length of 2km and is the most famous in Ios as offering crystal blue waters and golden sand. It has also large width so you can find everything on it like taverns, beach bars, rooms to let, water sports and stores. 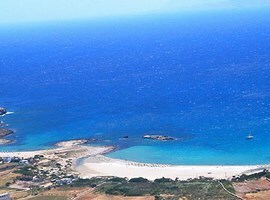 Yalos: Yalos beach is located on the Chora’s Gulf and it is really easy to access . Although it is next to the local port has very clean waters and an irresistible, organized golden beach. Many beach bars and coffee shops offer umbrellas and sunbeds to enjoy relax and happy moments. Sapounohoma: This strange word means in Greek soapstone and is the name of a small beach with great natural beauty. Three little palms and a traditional white chapel give to the place a special tone. This beach is quiet and ideal for those who love the calmness and romanticism! It is approachable only by sea. Psathi: A nice beach for relaxing moments, most popular to the fans of surfing as it’s a place usually windy with ready to tame waves. These sea waves have a unique color thanks to the ground morphology. On the left are located two nudist beaches. 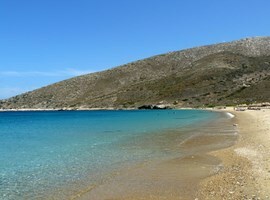 Koumpara: It’s a beach with orientation to the south so it’s protected from the norther which is usual in Cyclades. It is easily accessible and is an organized beach with sunbeds, umbrellas and beach bars with a lot of young people. 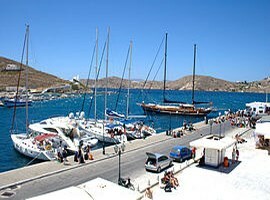 The most of the rooms to let and hotels are located in the Chora of Ios, in Mylopotas and in Yalos. There are luxury hotels, boutique hotels, apartments and also there is an available certificated place for camping. So, the island is ideal for all the people regardless of their budget. It’s good if you want to be relaxed and to have quiet to avoid staying in Chora as the parties last all night long! At first for your breakfast, you can taste a cheese-pie, made with local cheese. Also, it’s highly recommended to try the traditional dishes of the island like the tomato nuggets and the ‘’tsimetia’’ (stuffed zucchini flower). When you will take a walk on the narrow streets, make a stop at the local stores and buy honey of excellent quality, pasteli (sesame bar with honey) and some of the most famous and tasteful Greek cheese as feta, graviera, kefalotyri, myzithra and many more. At the port, you will find a municipality store with plenty of traditional, local products at reasonable prices. Although it is a small island, Ios is a special destination with natural beauties and unique beaches. The visitor who wants to escape from the usual holidays and look for something different in Ios will be really satisfied as they are available alternative forms of tourism according to your desires and your interests. Also, every year the municipality of the Ios Island organizes at the Open Theatre ‘’Odysseas Elytis’’ concerts with popular Greek and international artists. In honour of Homer, is organized the festival ‘’Homeria’’ with artistic and cultural activities (theatrical and athletic contests, art, photography and book exhibitions). Agro-tourism: After a request to the local and always willing breeders, beekeepers and fishermen, you can visit them and watch the entire production process like milking, pasture, cheese and honey production and others. Sea tourism: If you like sailing, in Ios you have the ability to anchor in the safest natural Cycladic port (that’s why Ios is called Small Malta) and also to sail around the island and enjoy secluded and virgin beaches. At the Mylopotas, Magganari and Port beaches you can enjoy the available water sports like canoe, jet ski, water ski, surfing and snorkelling. Athletic tourism: If you love sports, you can share with your friends exciting moments at the courts of football, basketball, volleyball and tennis which are located in Chora and Kampos. Religious tourism: As it’s already mentioned, Ios has 365 churches, monasteries and chapels you can visit if it is interesting for you. Also, you can take part in the local festivals of the island. The most famous are on the 24th of June at the Pyrgo’s monastery, on the 15th of August at the Holy Mary’s church in Chora and on the 29th of August at the Saint John’s church in Kalamos. At the Greek festivals usually are included live music, dancing, food and drinks. The museum was founded in 1998 and is located on the first floor of the island’s Town Hall. The Town Hall itself is a preserved building. The museum hosts many valuable Cycladic findings, the law inscriptions and the two columns tomb made by an artist from Paros. It said for Ios is the birthplace of the epic writer Homer and also he died there. They have been found some coins of ancient Ios and representing Homer from the 4th century BC. On the island there is a monument and the local people claim that is the grave of the ancient poet. The theatre was built in 1997 and is made of stone and marble similar to the ancient Greek architectural style. It can host 1000 people and has a breath-taking view to the Aegean Sea. During the summer many cultural activities take place in there. In Chora 14 lovely traditional windmills are located. You can visit them and take some unique photos of the most picturesque location of the island. 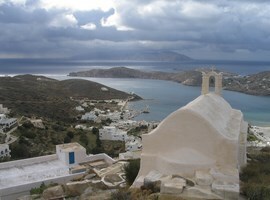 Chora is the capital of the island of Ios and is located on a hill with a great sea view. 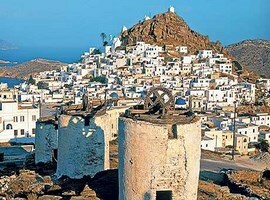 In Chora traditional style Cycladic white-coloured houses with blue shutters are built. Countless local stores with traditional products and youth bars are located here. All night parties, music and fun charm the young visitors. You have to remember that in Chora cars are not allowed. It’s a Byzantine castle, built at the north-western side of the island on the top of a hill. It was used by the Byzantines for the surveillance of the seaways from Constantinople to Crete. During the summer are available routes every day, so you can travel from the port of Piraeus with a fast ship (3-4 hours) or with a liner (7-8 hours). Also, you have the ability to access Ios from Santorini or Naxos. Inside the island you can move with the local buses which are quite frequent. Ios is a small island and transportation is not a problem. The services which are offered have a logical cost combined with high quality. You can swim in some of the most beautiful and clean blue waters of the Aegean Sea. If you are a young visitor, you can enjoy every single day with many other young people. If you are family or a couple, the places outside the popular Chora are quite calm and ideal for relaxation and romantic moments. Because it’s an island with irresistible natural beauty, breath-taking sea view, high quality accommodation for all the budgets and it’s an opportunity to spend your valuable holidays in a place which worth your visit. Surely, you will love it and you will want to come back again many times!